How to draw Jean Grey Phoenix X-men comics style step by step and video tutorial. This video tutorial shows you how to draw Jean Grey from X-men. There are two parts for the tutorial, You can click on the labelled buttons below the video to watch any of the two. You can scroll down further to see step by step images with instruction. I just saw Marvel production trailer of X-men spin off, “Wolverine.” It looks really promising, I really hope it will be as good as the trailer because I like the first two x-men movies, but not the third one. How to draw Woman Comics #005 Marvelgirl, Jean Grey, x-men phoenix Part 1 of 2. 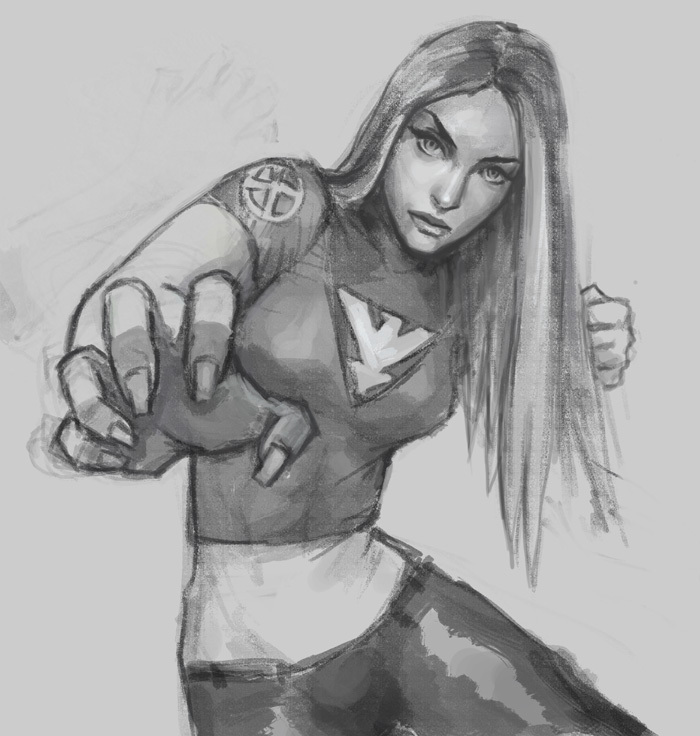 Draw and Sketch comics character, woman girl female Marvel girl, x-men Jean Grey illustration sketch. Learn from Step by step and video tutorial. This one is focusing on portrait of female character design for comics, video game, and Manga. The process shows drawing and sketching video series of comic book characters that (hopefully) will help you gain knowledge of anatomy and dynamics in the positioning of the figure and the details. In this tutorial, I will be adding some dynamic foreshortening in the sketch in part 2. In part 1, I’m focusing pretty much on the facial structure and the pose itself. Then I change my mind on the position of her hand and arm so I change it up and make another video for part 2. Jean Grey is a mutant born with telepathic and telekinetic powers. Her powers first manifested when she saw her childhood friend being hit by a car. She is a caring, nurturing figure, but she also must deal with being an Omega-level mutant and the physical manifestation of the cosmic Phoenix Force. She faces death several times in the history of the series, first in the classic “Dark Phoenix Saga” but due to her connection with the Phoenix Force, she, as her namesake implies, rises from death. More superhero tutorials here, How to draw comics Supergirl woman drawing tutorial is the most recent one. Then comes How to draw Fantastic 4 Susan Storm (basic figure line drawing with comics pose). This one is a little more intermediate sketch How to draw girl Emma Frost. For male superheroes, How to draw comics superhero spiderman, and my How to draw comics character Hulk, it demonstrate how to paint over and color. Who can resist to draw Captain, it has two video in How to draw Captain America. This one is an older drawing video demo, How to draw Batman or Darknight. Tutorials will be uploaded constantly, see you soon.